What Materials Do You Need To Create A Vision Board? If you I've never created a vision board before it's easy to give very overwhelmed with the minor details. What magazines should I get? How large or small should my vision board be? How do I create a vision board that will really make a difference in my life? Vision boards can be incredibly transformative in your life, but you have to put a little bit of effort on the front end before you start building it. Gathering all of your materials before you get started means that you can dive deep into creating your vision without and have unlimited inspiration without any interruptions. It takes me about 5 days to create my vision board. That's because I start out with thinking about the goals that I want to accomplish. Once I have the goals I want to set in mind, I get all of my magazines together. (I usually have a large stack ready to finger through because I collect magazines throughout the year.) After that, I start to build my vision boards using all of the magazines and even once I have all of the space filled on my board with magazine clippings and quotes and images, I continue looking through magazines to take out the weaker images and replace them with better ones that really speak to my soul. Cork board: I personally use a giant cork board. Every year I remove all the images and quotes that I put on my cork board and I create an entirely new vision. I have used the same board for about 4 years now and it is still intact. A cork board is great if you want to put a few nails in the wall and hang it. I've had my vision board right above my bed for the last three years. Journal: A simple, plain white paper writing journal can be a great place for your vision. If you use a journal then your vision board can double also a space where you can drive down all of your ideas and keep track of your progress. 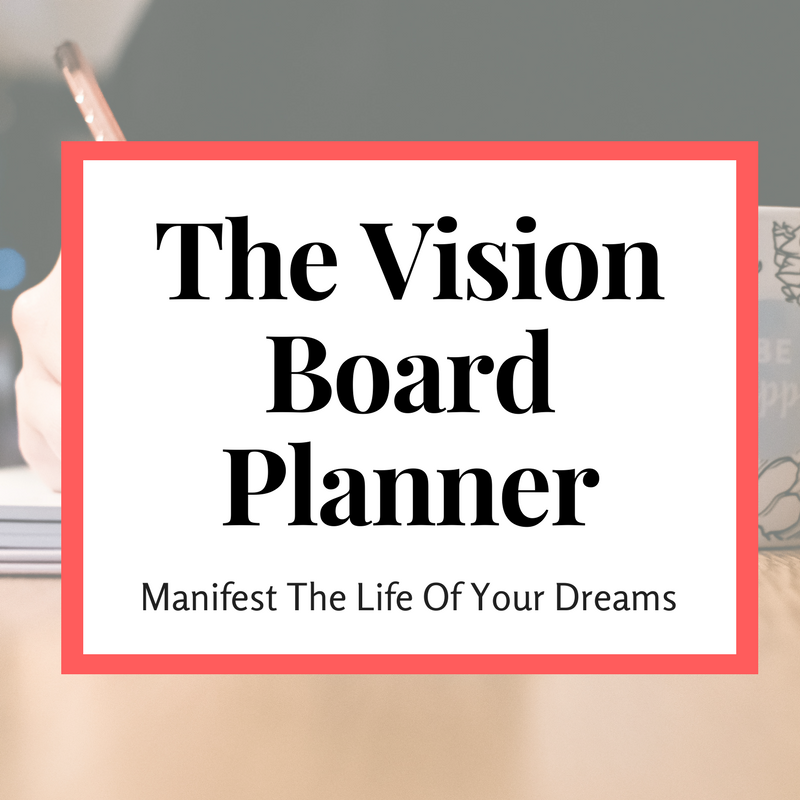 You can also take your vision board with you on the go because you can just close your journal, take it with you and refer to it anytime you want. If you choose to go this route, I would definitely use a large-sized journal so that you can put a lot of different ideas on it. The magazine clippings you choose make up your entire vision - and be your inspiration for the entire year #nopressure. The magazines you choose are very important. Get started with a good selection of magazines. Try to find magazines that will cater to every area of your life. While it's super fun to pick all of the fashion magazines, you may want to also subscribe to family, health, money, wellness magazines and also home decor. Every year, I build my vision with about 20-30 magazines. The easy way to get 30 magazines (without losing hours in the magazines section at Walmart or trying to find gems in the free family magazines they have at the grocery store) is to get an magazine subscription. I have magazine subscriptions to Sunset Magazine, Women's Journal, Golf, Essence, Money and Women's Health. Every month (or bi-monthly depending on the magazine schedule) I receive a magazine in the mail and I just stack them up throughout the year. By the time I'm ready to create my next vision board they're just sitting there for me, ready to devour. You are a dynamic person. That means you will likely be setting goals for several areas of your life. You'll want to have the right inspiration at hand when you create your vision board. An assortment of magazines focus on different life areas will ensure that you don't have to stop building your vision because you don't have the right information that you need to set a goal in that area for the year. I highly recommend using a simple glue stick if you are using a poster board. I never ever use white glue because if you use too much it can make your magazine clippings look wrinkly it takes longer to dry. You could also use two sided tape. One sided tape is fine, but I prefer two-sided tape so that you can put it on the board and put your magazine clippings on there and then you never have to worry about seeing the tape on the outside of a magazine clippings. Before you start looking through any magazines for inspiration on where you want to take your life make sure that you already have a concrete idea of what you want to accomplish next. Magazines are created to sell advertising space - that means they will have the most beautiful unrealistic-looking size 0 models, mocking you with their perfectly airbrushed skin. They will present you with every new trendy style and piece of jewelry that you must have to have to make your life better. Magazines will encourage you to get healthier, build better relationships, get every recommended product for more voluminous hair. Real goal Setters are not interested in following anyone else is version of success. WE DEFINE OUR SUCCESS.... and we don't care what anyone else thinks about it. Before you start vision board building, take some time to block out everything that's going on in the rest of the world and focus on what's going on inside yourself. Ask yourself what you want to accomplish and what kinds of things you would like to do with your life next. Once you have your goals and all your materials ready to go, the only thing that's left is to build your vision board.